The term Anthracosis is a combination of two words. Anthrac means carbon and osis means condition. Anthracosis is a type of generic term that is used to refer the blackening of the tissues. The darkening black color of the tissues is due to the excess carbon inside the lungs. Due to the constant exposure to the coal dust and the pollution, it can be inhaled directly into the lungs. Patient suffering from Anthracosis gets carbon accumulated inside the lymph nodes. The Anthracosis can be mild to acute and it depends upon the environment and the time duration as well. There are various passages of lungs that are naturally developed. These passages are called bronchi. A patient suffering from the Anthracosis actually gets the discoloration issues. The discoloration of the bronchi is due to the presence of the carbon and its pigments. As soon as the carbon pigments build up at the bronchi it causes deformation. The breathing process is deeply affected by the problem because there is an obstruction in the bronchi. Patient can have severe breathing issues along with the other complications. The issue is directly concerned with the exposure to the wood smoke and the dust in the air. There are number of ways through which Anthracosis can be avoided. It is recommended that individuals working in the coal mines should use mask in order to avoid inhaling the wooden dust particles. Using the mask can prevent coal particles to accumulate inside the lungs. Another practice that can reduce the risk of having Anthracosis is that the individuals should try to ovoid the long term exposure to the coal dust. Anthracosis can be complicated as well. There are various signs and the symptoms that can identify the issue. During the early stages of Anthracosis, a patient can have respiratory issues; likewise shortening of breath is often claimed by the patients. Consistent cough can be one of the other symptoms of Anthracosis. There is a thick viscous substance secreted during the issues, this viscous substance is actually secreted by the mucous membrane of the lungs and is called as phlegm, in this particular problem there is a consistent production of phlegm as well. In mild Anthracosis there are lung opacities, but in sever kind of Anthracosis patient can have massive fibrosis in the lungs. Due to the presence of the fibrosis, patient suffering from Anthracosis requires increased effort to breathe. Anthracosis is most commonly occur due to long term exposure to corbon mixed air (polluted air). People working in chemical factories, petroleum processing plants and those living metropolitan areas where carbon is excessively present in air are main target of anthracosis. Smokers also have high chances to get anthracosis at some point of life due excessive and continuous exposure of carbon via smoking. As far as the treatment is considered, the patient suffering from the Anthracosis is treated after examining the condition. The symptoms can be mild to severe, there are some typical medical drugs used to the treat the patients. These drugs are mostly bronchodilators and corticosteroid. There are various therapies that can also be applied on to the patient, these therapies are done in order to make it sure that the secretion are completely removed. Along with the chest therapy there is management that is to done, most of the people don’t know that the Anthracosis can cause other issues as well. 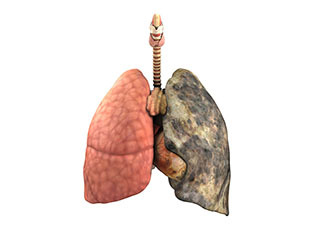 One of the prominent issues is TB that can cause extreme respiratory complications to the patients.